Finding the right office products for your team is one of the biggest hurdles when it comes to getting the correct communications structures in place for your business. However, what should be a straight forward process can often be made more complicated by the sheer amount of choice offered to businesses. This guide will attempt to simplify the search by comparing the best VoIP headsets from leading suppliers and guiding readers through a number of areas that should be covered when investing in VoIP headset technology. Why Use a VoIP Headset? Advantages of VoIP Headsets for Business? Remain fully connected. Be ready to speak at a moment’s notice, without needing to continuously pick up and put down the phone throughout the day. Move freely around your office or other work environment without the hassle of wired connections. Prevent muscle soreness. As well as avoiding the tiring discomfort of juggling a desk phone handset, a VoIP headset allows you keep your natural posture while making a call , preventing any negative impacts from holding a traditional handset in an awkward pose for some time. Free up your hands. Continue to work on other tasks while you take calls. This can be a great benefit if taking queries or answering questions and also allows you to multitask and improve productivity. Improve the clarity and audio quality of your calls. Even in loud work environments, an optimally-positioned headset microphone and Noise Cancelling technology means you can continue with your everyday tasks with no hassle. Below are the individual reviews for all the models listed, using the navigation above you can navigate directly to the model you want to view. 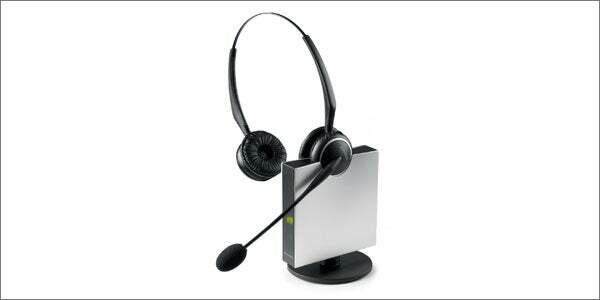 A portable headset with good audio quality for heavy voice users in a Unified Communications environment. Sennheiser SC 630 and 660 wired headsets are certified for Skype for Business in contact centers, offices or Unified Communications (UC) environments. They offer HD voice clarity, durability and all-day comfort. Users can manage calls seamlessly through the call control unit. The SC 630 is a single-sided wired headset while the SC 660 is a dual-sided unit offering stereo sound from dual-sided neodymium speakers. 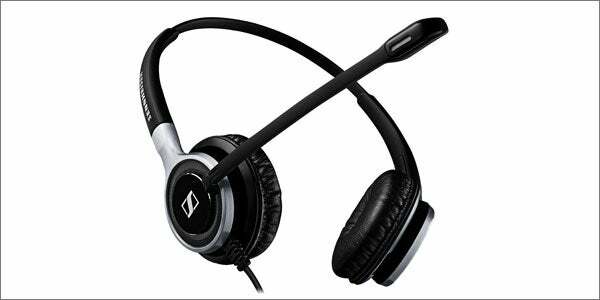 Sennheiser SC 630 and 660 wired headsets offer quality audio in a model designed and certified for Skype for Business. The Yealink YHS32 is designed for office workers, home workers and call center agents and can be used with any Yealink enterprise IP phone. Ultra-noise cancelling technology ensures excellent voice quality. This over-the-head style headset is ultra-light weight at only 50g.and features large ear-pads, a padded T-bar, pliable steel headband and 330°rotatable microphone boom. These features ensure a comfortable fit, even when worn all day. The Yealink YHS32 offers a combination of comfortable user experience, durability and good voice quality at a competitive price. The Plantronics Blackwire 700 series includes two UC headsets – 710 and 720 – that offer high-quality audio and Bluetooth connectivity to mobile devices. The products feature smart sensor technology that automatically answers a call when users put on the headset. A noise-cancelling microphone and wideband hi-fi stereo sound ensure high quality audio suitable for conference calls or call center applications. A dynamic EQ feature optimizes users’ voice quality when on calls. A versatile headset for users who need to work on both wired and wireless devices, and want the same high-quality audio on both. 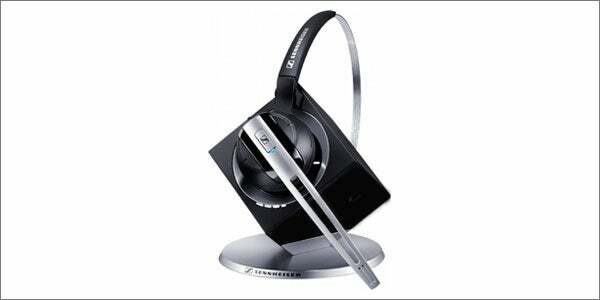 The Sennheiser DW Office is a single- sided premium DECT headset for desk phone and softphone. It is available in three models for softphone, desk phone or dual connectivity. HD sound and voice clarity ensure a natural experience for caller and listener. ActiveGard® technology protects against acoustic shock. A versatile headset that offers high-quality audio, a choice of wearing styles and dual connectivity. The Streamline ProV series headset is an entry-level wired headset suitable for casual and all day light office use. It is available in both 1 and 2 ear versions and features a noise-cancelling microphone. The Streamline ProVX series headset comes in both 1 and 2 ear versions with an easily adjustable headband. 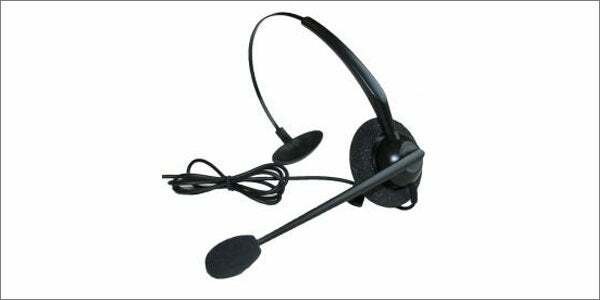 This professional quality headset is suitable for small and large contact centers and office environments. These headsets provide reasonable quality for entry level models, with options for light and all-day use. The Plantronics CS540 claims to be the lightest DECT™ headset on the market. It features one-touch call management and voice-dedicated DECT™ technology with wideband audio for high-definition voice quality. An extended boom and noise-cancelling microphone filter out background noise and Digital Signal Processing (DSP) provides more natural sound. The headset is available in four options – convertible, over-the-ear, over-the-head and behind-the-head. 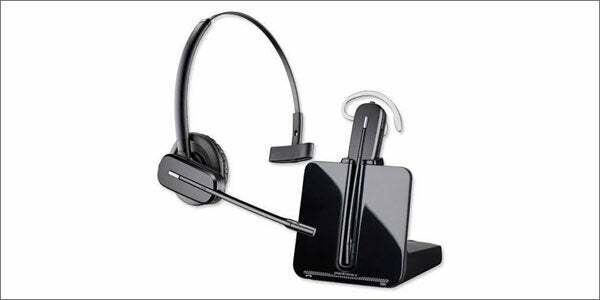 This high-quality wireless headset provides mobile employees with excellent call quality in a lightweight unit. The Sennheiser DW Pro 1 is a DECT-based single-sided wireless headset designed for all-day users working in noisy environments. The DW Pro 2 is a DECT-based double-sided version designed for the same environment. . The models claim to offer fail-safe wireless solutions that are comfortable to wear and intuitive to use. 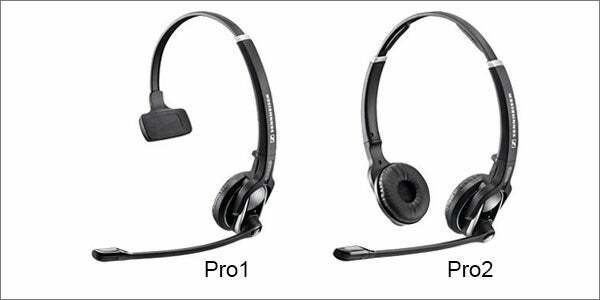 These headsets are available in dual-connectivity, desk phone or softphone/USB connectivity variants. The Sennheiser DW Pro 1 and Pro 2 give flexible, reliable performance for users who want to remain in contact throughout the day. The Jabra GN9125/ST/Duo is a wireless DECT headset that works with traditional deskphones at a range of up 300 feet (90 meters). Users can connect up to four headsets to one base unit for conference calls. 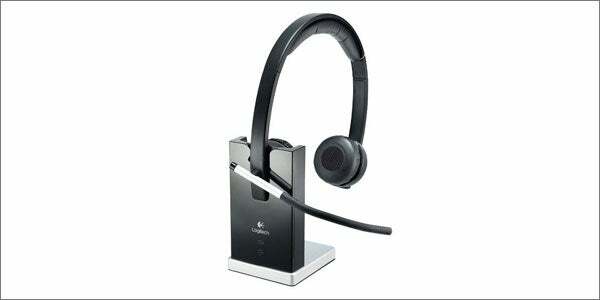 A practical wireless headset with good range that offers the convenience of conference calling from a single base unit. The Logitech H820e DECT Wireless Headset offers enterprise-quality audio and all-day comfort for heavy use in open workspaces, offices or home offices. It features Intuitive on-ear call controls and a mute button with indicator light on the microphone boom. Digital signal processing and wideband audio provide clear lifelike sound quality. This is an enterprise-grade wireless headset offering many useful controls and indicators as well as lifelike sound. Have you found the best VoIP provider for your business? Compare price quotes and suppliers with Tech.co's free tool. Now that you’ve chosen Voice over Internet Protocol – also called VoIP and IP telephony – technology as your voice communications platform, it would be easy to get lost in the details of exactly which system or solution would be the best for you. Keep in mind, though, that the piece you will be interacting with most is the headset. Getting that right is key to making the most of your system. We’ve created this guide to help you make sense of the terminology, and to help you choose the best headset for VoIP use. While the ins and outs of VoIP software may be complicated, the headset itself is a fairly simple device. There are really only 3 main components: the Earpiece(s), the microphone, and the computer connection. Just like every headset or headphones you’ve ever worn, your VoIP phone headset has either one or two speakers which convert electronic signals into audible sounds. They are usually covered with soft foam or padding for comfort, but in-ear and on-ear options are also available. Again, this is a device you are probably fairly familiar with. It converts your voice (or other sounds) and converts them into electronic signals. It is the ‘opposite of the earpiece. The microphone may incorporate noise reduction or sound processing features to better capture your voice. VoIP headsets connect directly to your computer (softphone) or other VoIP device (e.g. VoIP desk phone). There are two main types of connection – wired and wireless. 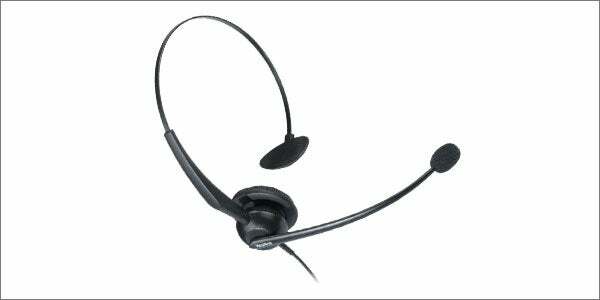 Wireless VoIP headsets often rely on Bluetooth technology, just like many smart phone headsets. Wired or Wireless – Wired headsets would be suitable for call center agents who do not need to move from their desks while on calls; wireless headsets naturally enable a greater range of connected movement, ideal for managers, small business entrepreneurs and those whose work involves being constantly on the move. 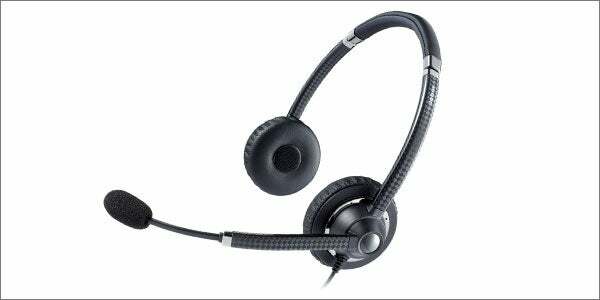 Monaural or Binaural – Monaural headsets feature a single earpiece that can be fitted for either the right or left ear, enabling the user to switch listening focus easily between their immediate workplace and their calls. Binaural headsets feature earpieces for both ears, and may include Noise Cancelling technology (see below). Most of the models featured in our list are convertible or come in both monaural and binaural versions. Headband, Over-the-ear or Convertible – Basic headsets will typically have a headband design, but mid-range and more advanced models may give you the option of detaching the earpiece from the headband and using it with a small over-the-ear clip instead. The Plantronics CS540 Wireless kit is an example of a convertible headset design (featured in our review list below). Wired headsets might use 2.5mm analog mini-jack connections, but better models will typically have USB or Micro-USB connections. Wireless headsets can connect over one of two wireless technologies, DECT or Bluetooth. DECT (Digital Enhanced Cordless Telecommunications) is typically considered the most reliable for business users, with a significantly greater wireless range. There are several reasons than most VoIP users choose to use headsets to make VoIP calls, even when traditional ‘phone style’ handsets are available. The first is that VoIP headsets are hands-free. This allows you to make and receive calls while performing other tasks and typing. As most business calls require us to enter or retrieve information of some kind, this is particularly useful. Next is the enhanced selectivity of many VoIP headset microphones. Many incorporate both physical design elements and software features which allow them to ‘focus’ on the user’s voice, filtering out background noises and other voices. This is vital in a noisy office or call center, but gives your company a more professional voice in any office. 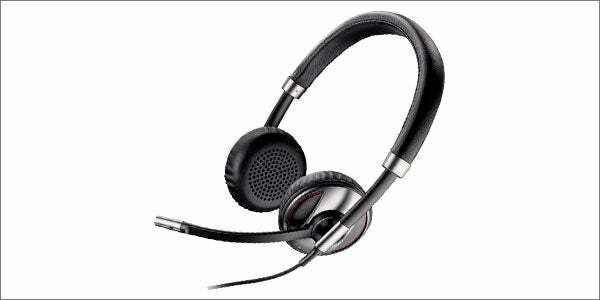 VoIP headsets are also great options if you or your employees handle a large volume of calls each day. After a few hours, simply holding a traditional handset u to your ear can become tiring, and doing so day-in and day-out can lead to repetitive stress injuries. You have to consider how your office uses VoIP, and how reliant you are on phone calls in the first place. If you are equipping a call center, you’ll need top of the line background noise cancellation technology. You’ll also want to avoid wireless devices to minimize signal interference, and the confusion of placing all the headsets on the correct workstations to charge at the end of the day. If you’re equipping a small open plan office or individual offices, then the convenience and flexibility of wireless VoIP headsets may be the deciding factor. Budget is almost always an issue as well. If you need 500 units, then shaving a pound or two off the price of each headset becomes important. If you only need a handful of VoIP headsets, though, adding a few pounds each for a bit of luxury might improve your experience. So now you know just about everything you need to choose the best VoIP headset for yourself and your office environment. Of course, if you would like to discuss your options with an expert, we would be happy to help. With this selection, we’re confident that you’ll find exactly the right headset model for your particular requirements – whether you’re a solo entrepreneur, a small business or are running a call center with dozens of agents. 1. Unlimited numbers: With VoIP, the number of simultaneous calls that can occur over a single Internet connection is not limited in the same way it would be with traditional phone systems – you can have all the virtual lines you need, each with their own number, set up over your normal office broadband connection. 2. 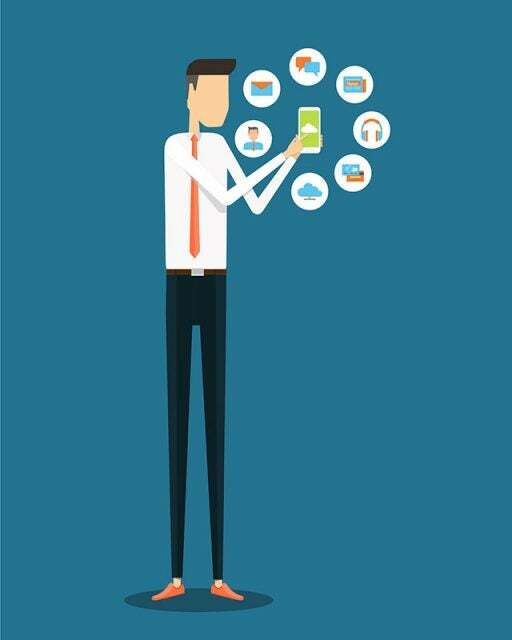 Mobile VoIP keeps you connected on the move:Whether your business or job role requires you to be constantly moving to different locations throughout the working day, or you anticipate needing to move headquarters or premises in the future, VoIP services have you covered. VoIP service plans will include apps to connect your smartphones and tablets to the business phone system, using your office numbers for sending and receiving calls and messages, regardless of your actual physical location. The numbers you use can be your old PSTN-based numbers, new numbers, toll-free or international. 3. Connection solutions for any business type: Despite VoIP using relatively advanced networking technology, you can use VoIP services with a wide range of devices. Making or receiving a regular phone call over VoIP is exactly the same as with a traditional phone: pick up and dial the number as usual. There are no extra numbers to dial or special routines to follow as there might be with analogue PBX-based phone systems if you want to make external calls. You don’t even necessarily need a new IP phone, just an ATA (analogue telephone adapter) for each old phone to plug into the VoIP network – an important option to consider if you’re a smaller business looking to minimize the initial setup cost when switching to VoIP. Alternatively, all you need is a VoIP headset (incorporating headphones and a microphone) to turn your existing desktop PC or laptop into a VoIP-enabled ‘phone’. Compare options with Tech.co's free tool.